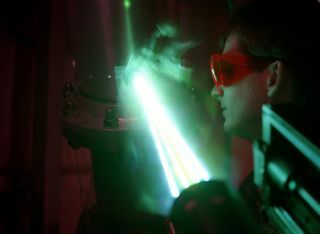 A NASA engineer measures velocity and gradient distortion with lasers during a cold-flow propulsion research test in 1997. In this historical photo from the U.S. space agency, an engineer at the Marshall Space Flight Center (MSFC) Wind Tunnel Facility uses lasers to measure the velocity and gradient distortion across an eight inch curved pipe with joints and turning valves during a cold-flow propulsion research test in December of 1997; simulating the conditions found in the X-33's hydrogen feedline. Lasers are used because they are non-intrusive and do not disturb the flow like a probe would. The feedline supplies propellants to the turbo pump. The purpose of this project was to design the feedline to provide uniform flow into the turbo pump.